What's that common saying about the road to hell being paved with good intentions? Whilst I did have very good intentions both at the very beginning of the Terry Pratchett 2010 Reading Challenge and at various times throughout the year, I am not sure that I deserve that grim fate for being a bad challenge host! I thought that as the challenge comes to an end, I would do a post listing everyone who participated in the challenge this time around, and that next week I would create a list of all the reviews that were written as part of the challenge! At least that is my intention. While I don't think I will run the challenge next year, I am contemplating doing it again the year after, maybe making it a bi-annual challenge. I have certainly enjoyed all the books I read this year for the challenge, and look forward to reading more in due course! I still have a couple of books sitting on the shelf and I am sure I will continue to read more Pratchett books. I want to give a special shout out to Caty from Miscellaneous Mumblings who completed an amazing 17 books! Well done Caty! Please let me know if I have missed you off the list of participants in the challenge, or if you want to share what level of achievement you achieved. I think you've done an awesome job and I thank you for hosting my first Challenge. I love to read this series again, so please host the challenge next year. I read one book, so I guess technically I didn't fail, but I wanted to have read a lot more. Booo :( But thank you for hosting, Marg! You know I'll be back for 2012. I thought I might not finish this one but am now reading my 6th. book, (Thud!) so it looks like I will. yaay! I finished one book, which was my aim really, so I'm quite happy to finally try Pratchett. Thanks for hosting. I have yet to write review on the book (I read Equal Rites). Soon I hope! Thanks for hosting the challenge, I didn't actually get as many books read as I was hoping to for this one (I was originally aiming for 12) but I did read 5 and had the chance to go to a Terry Pratchett release party too so it was good fun! Oh, a Terry Pratchett release party! That would have been awesome to go to Sarah. The list of reviews should be up on Sunday. Mee, I am so glad you met your aim! That's a successful challenge really. Well done Cath! I think I ended up reading 5 or 6 myself. Will have to check my list. 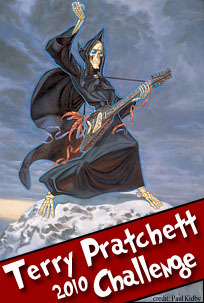 Nymeth, I always want to read more Pratchett! Thanks for participating. Hi Aradia! You did amazingly well to complete the challenge in January! I did see your wrap up post, and will link to it in the reviews post. As for next year, I have something else in mind which will hopefully interest you, but I will definitely think about doing this one again in 2012. Thanks Suzie, glad you enjoyed your first challenge experience.